Just like you, I've been seeing the headlines for weeks: Pain at the Pump...Gas Prices Climb For 20th Straight Day...Will Gas Prices Stall The Economy? I'm of two minds about rising gas prices. On the one hand, it means more people will get into cycling. On the other, it's already getting harder for me to find a parking space in Stamford. I am dreading continued increases in gas prices for the simple reason I'm tired of hearing the same news stories over and over again. Since the news media isn't willing to tell us all to drive less, drive smarter, bike more, develop other modes of transport, unmask the opponents of the President who want gas to cost over $5 a gallon by Election Day or provide other useful insight, we're left with hollow stories featuring various Area Men and Area Women complaining incessantly. 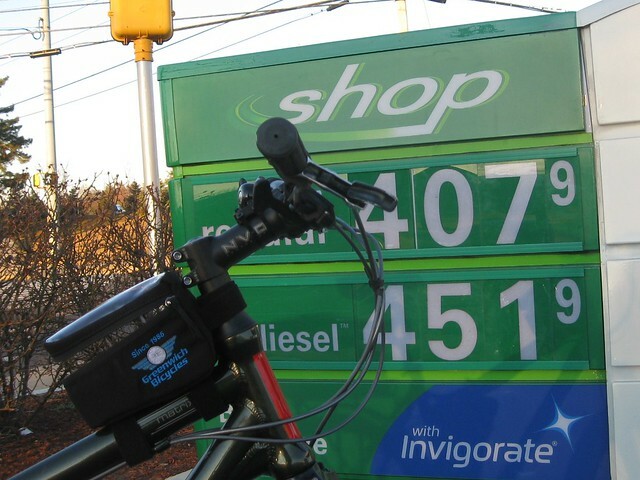 This was how much gas cost a few short weeks ago when I rode the Dahon Matrix to work. For my own amusement I calculated out what my reward would be: 3.5 miles to get to work, 3.5 miles to get back. 7 miles total in a car that averages about 23 miles to the gallon means driving one mile costs $0.17 cents. That means, in one seven mile trip, I save enough money to buy two donuts from the Bedford Street Diner and still have $0.20 left over. This doesn't always mean I use the savings to buy donuts: since I usually ride to work early in the morning I don't pass the diner late enough to catch the 'donut window' when the treats are available. This meant my car was now costing $0.18 a mile, and one seven mile commute was now saving an extra four cents – 1/8 of a Bedford Street Diner Donut! – each round trip. But now we have to look at the scale of the price hike a little bit bigger, and if you find yourself talking with car driving friends who have no interest in using a bike to run errands (or using a bike for anything, for that matter) this is where the conversation has to go. 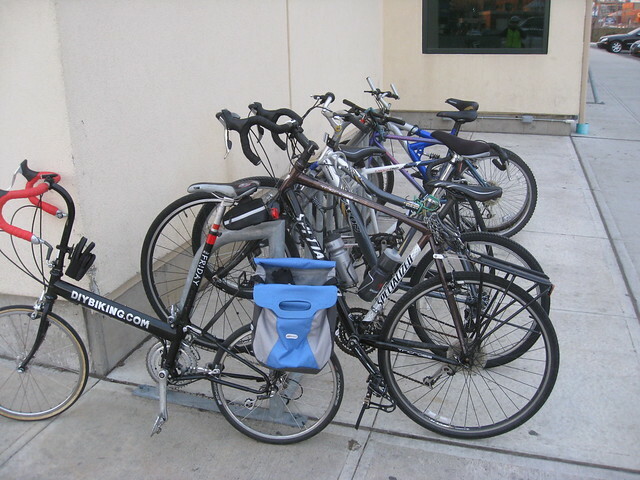 Since the goal – limited bicycle parking options aside – is to get these good people to get into cycling, we have to showcase the real savings to be had when biking; especially when they consider the higher cost of fuel over the course of a year. For simplicity's sake, let's say your friend drives an average of 15,000 miles a year and the price of gas went up $0.50 a gallon. I made the table below to account for vehicles that get 15 miles per gallon (MPG) all the way up to 45. 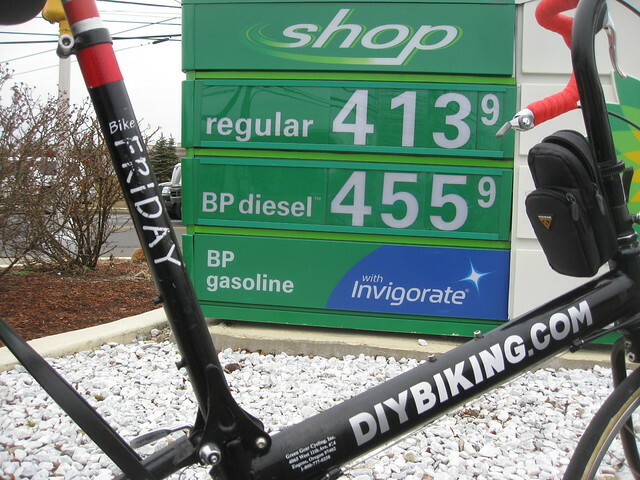 No matter what someone drives, an extra $0.50 per gallon can cost a lot over the course of a year, but instead of leaving that person with hollow statistics, give them a concrete perspective of what could be bought at great bike shops like Danny's Cycles, Greenwich Bikes and Pacific Swim Bike Run with each gas price hike. Nobody should say: "How can I afford to buy a bike?" but instead: "How can I not afford to buy a bike?" If one drives less and bikes more, it adds up to real savings that goes way beyond donuts (but speaking of real savings: Greenwich Bikes is having a big sale from March 29th to April 1 and Pacific Swim Bike Run currently has some deals - up to 45% off MSRP - of some of their 2011 model bikes). Now, I know that I could have made a table that shows how much money can be saved if a person drives less. 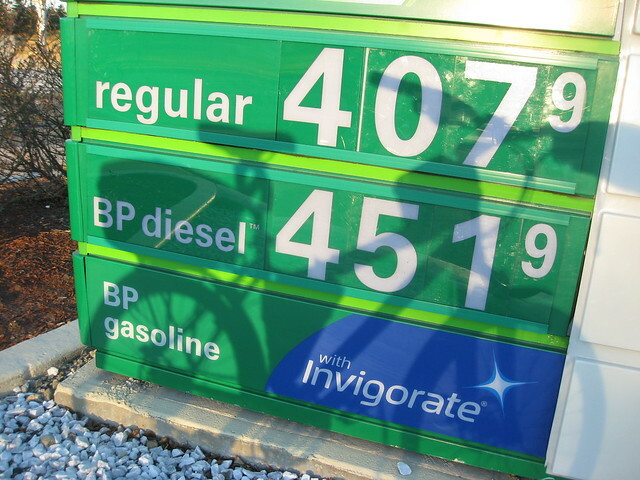 But I didn't for the simple theory that if a cyclist tells a motorist who complains about gas prices that they should drive less, they won't – and they'll make fun of our padded shorts. 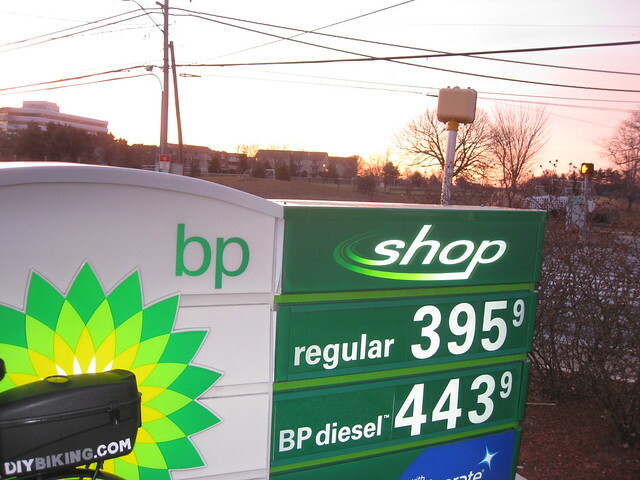 But if you tell them they could buy a new bike, some classes or new accessories with the difference between $4.35 and $3.85, they might just start thinking a little more like us – which is a slightly less scary thought than $5.00-per-gallon gas.